India and Japan are the true champions of Asian Democratic Spirit. The ‘Asian Democratic Spirit’ as defined by PM Modi is based on “openness, and not dogma, and engaging in philosophy, not ideology.” The values of self-restraint, mutual respect, the idea of collective efforts, and a tradition of effective dialogue, that are deeply rooted in the Hindu and Buddhist philosophies constitute the Asian democratic culture. In 2015, Prime Minister Narendra Modi and Prime Minister Shinzo Abe have inaugurated the ‘SAMVAD’ an initiative of Vivekananda International Foundation of India and the Tokyo Foundation of Japan. The SAMVAD series of conferences was launched to promote the Hindu and Buddhist traditions of democratic dialogue, conflict avoidance, environmental consciousness, and the spirit of tolerance that appreciates diversity, something about which the world needs to get more informed today. One of the key characteristics of Asian democracy is that it has an integrated viewpoint which put emphasis on both the individual and society, while the western democratic model focuses on individualism alone. 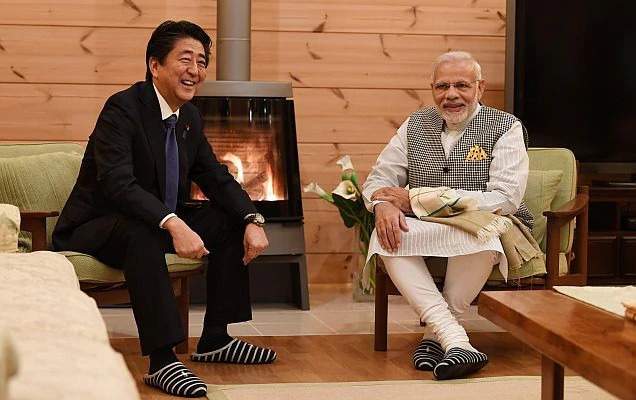 A matchless spark and trust are quite visible in Modi and Abe’s special partnership. Both leaders are known for sustaining the soul of their rich ancient principles and philosophies in their acts while working on the roadmap of future growth. In 2015, PM Shinzo Abe had performed Ganga Aarti with PM Modi at Varanasi Ghat and in 2017 he joined PM Modi on a Mega Roadshow in Gujarat, and around the same time they both have launched a number of ambitious initiatives together, such gestures are not so common in the culture of foreign relations. In 2017 India-Japan Annual summit, both leaders have launched the design of an International Cooperation and Convention Centre in Varanasi, which PM Modi has named as ‘Rudraksha’, and called it “a tribute to our shared Buddhist heritage present in Sarnath.” This centre will promote the cultural exchanges between the India-Japan and other countries as well. Japan’s remarkable participation in the key initiatives of ‘Transforming India’ is a reflection of Asian collaborative spirit too, which seeks partners for the growth and prosperity of the region and for the world at large. The roots of India-Japan partnership which are based on common values and shared philosophies are deep, and the current leadership of both sides is determined to advance the “New Era of India-Japan relations” with their holistic vision and action-oriented approach. The focus of this partnership is to foster a new trust and confidence in the Indo-Pacific region by strengthening communication and connectivity which is crucial for establishing rule of law, unhindered trade and flow of people, technology and ideas for collective prosperity. The commonalities in both countries’ collaborative approach have helped them to find synergies in the third countries too such as in Sri Lanka, Myanmar, Bangladesh, and Africa. To further leverage this potential both Prime Ministers have started discussions on establishing a “Platform for India-Japan Business Cooperation in Asia-Africa Region” for developing industrial corridors and industrial network in the region. Japan is the first country which is allowed to invest in the infrastructure in North East India along with other strategically important parts of the country like Jharkhand and Andaman and Nicobar Islands. Japan is an important partner in PM Modi’s ‘Act East policy’ too. Through last year launched “India-Japan Act East Forum”, Japan is actively participating in the transformation of North East India with different connectivity, ecological management, and disaster risk reduction related projects. The Japan International Cooperation Agency (JICA) has invested in a number of quality infrastructure-related projects in North East India and other parts of the country and has provided ODA loans to some crucial projects related to power, roads and connectivity, high speed railways, metros, dedicated freight corridor, industrial corridor, and water management etc. The progress made in Mumbai-Ahmedabad High-Speed Rail project, Western Dedicated Freight Corridor and Delhi-Mumbai Industrial Corridor are some of the noteworthy examples. India and Japan are preparing for a Joint Lunar Polar Exploration Mission too; discussions to produce a joint mission proposal are already underway. Indian Space Research Organization (ISRO) and the Japan Aerospace Exploration Agency (JAXA) have already mounted some successful independent lunar missions in the past i.e. Selene orbiter mission of JAXA and ISRO’s Chandrayaan-1, and their next lunar missions are in their final phase too. India and Japan’s space partnership will yield not only crucial scientific research and techno-economic gains but in the long term, it will prove to be a blessing for the Indo-Pacific region. PM Modi’s ‘collective efforts, inclusive growth’ philosophy and Prime Minister Mr. Shinzo Abe’s three arrows of monetary stimulus, fiscal flexibility, and structural reforms are responsible for the breathtaking progress that both countries are going through. Their transformative vision has given a push to both countries trade partnership too. Japanese companies are enthusiastically participating in the key initiatives of Indian government i.e. Make in India, Smart Cities, Digital India, Skill India, and Clean India Mission. To facilitate Japanese companies the Indian government has provided a dedicated structure called ‘Japan Plus’, this platform helps Japanese companies including SME/MSMEs to fast track their investment proposals in India. During PM Modi’s recent visit to Japan, some 60 Japanese companies have proposed investment projects of approximately 280 billion JPY with a target to create over 29,000 additional jobs in India. These ‘Make in India’ projects related to different sectors i.e. automobile, steel, electronics, IoT, AI, chemical and food processing, etc., will be facilitated by Invest India and JETRO. Apart from this, the progress made on India-Japan Digital Partnership, Startup cooperation through the establishment of Startup Hub in Bengaluru and an online platform, cooperation in R&D and ICT projects is quite satisfactory. To sum up, one can say no other country has better aligned with the vision of Transforming India than Japan. PM Modi often says: “without the cooperation between India and Japan 21st century cannot be a century of Asia.” Some of the challenges of our times such as economic stability, counter-terrorism, cybersecurity, clean energy, food, and water security, environmental protection and disaster mitigation etc. need trusted and like-minded partnership. The mutual trust and maturity of the India-Japan Special Strategic and Global Partnership have made it possible for both countries to join hands in their endeavors to build a more secure, peaceful and prosperous region and the world. The Asian philosophy of mutual respect which appreciates diversity, effective dialogue and promotes peaceful co-existence should be the new model of democracy for the world.